The pilgrim says goodbye to Hontanas (459 kilómeters to Santiago) along the Calle Mayor. Shortly after leaving behind the local pool, the Camino crosses the BU-P-4013 road. They then arrive at a dirt path on the right which, four kilometres later, returns to asphalt. In between there is little to see except for the ruins of an old tower. Back on the road (dual carriageway but very narrow and without a hard shoulder, therefore uncomfortable and dangerous), pilgrims can find shelter and shade on this long stretch among the ash trees that mark the route. In the background the remains of the monastery of San Antón can be seen. Monastery-Hostel Antonians. Video After the exceptional ruins, the route returns to the road, which is not left until arriving in Castrojeriz. 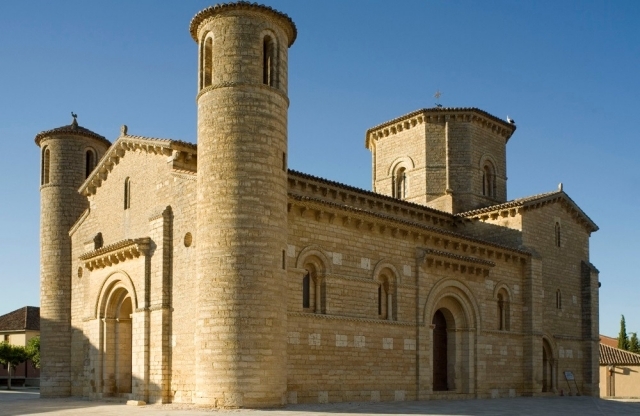 Castrojeriz, given its size, importance and the services it offers, is a good way to spend the rest of the day and those doing the route without the burdens of time may even considered an overnight stay. It is worth taking into consideration that from this point to the next hostel there are 19 kilometres in distance, and a steep slope to tackle. For those arriving exhausted, access to the heart of the city can become tedious, since Castrojeriz has experienced significant growth over recent years, but in the centre of the town, most services required by Pilgrims and tourists are available. The magnificent Castrojeriz is abandoned in search of Tierra de Campos but first walkers must face a great obstacle. The moment hikers cross the same road that leads to the pilgrims to Castrojeriz, the peak of Mostelares can be observed, even from a distance. This stage is not overly difficult, however the climb can be rather tough, especially, in adverse weather conditions. There is a lack of shade to offer respite or fountains to quench thirst, and this area can often be windy. Before, there is a stretch on flat terrain and a small bridge to cross to arrive at a crossroads where, as indicated by the signs, pilgrims should turn left. The route to crown this mountain is mostly on an earthy track, although there are some areas in which small stones make an appearance. Two vertical traffic signs provide information: For a little over a kilometre there is an average gradient of over 12%. Halfway up the climb there is a memorial stone dedicated to the pilgrim José G. Valiño. Once at the top, the pilgrim encounters a humble resting area. A few meters from here is the Camino, or at least there are signs for it. The route abandons the road and takes a small detour that is a little difficult to see due to the height of over grown weeds, an indication that most walkers opt for the other route that continues straight ahead, fully aware that the two routes meet 300 meters ahead. Having completed this small stretch on flat terrain, the pilgrim now faces a descent of dizzying heights on a newly resurfaced track, along which they will encounter a tombstone in honour of a deceased pilgrim from Malaga. From this height, walkers are provided with privileged yet simple views of open fields over Tierra de Campos. Towards the end of the steepest descent the Camino again transforms to an earthy track. A crossroad indicates the directions for those wanting to continue the journey (left), as well as those wishing to visit Ítero de la Vega (right), a small town with a hostel. Once hikers have conquered the summit of Mostelares, the downhill sections clearly predominate over the flat and ascending terrain. At one of the few ledges and in front of a resting area, there is the fountain of Piojo. At first glance it is not very attractive, but the water that pours from its pipes is so good that residents from nearby villages cover several kilometres to reach the spring and fill huge bottles with its precious liquid. The pilgrim approaches the river Pisuerga, the border between the provinces of Burgos and Palencia. Before reaching, the simple yet stunning chapel of San Nicholás de Puente Fitero. Romanesque in style, it belonged to the Order of San Juan of Jerusalem. It remained abandoned for hundreds of years until Paolo Caucci, a professor at the University of Perugia and president of the International Committee of Experts of the Camino of Santiago, decided to rehabilitate it. It now functions as one of the most unique hostels on the whole Camino. Here they still practice the foot washing ritual of pilgrims. Lino Tomasso, senior hospitality worker for Confraternita di San Jacopo di Perugia explains: "In the evening, in accordance to the most venerated pilgrimage tradition of evangelical mandate compliance, whilst they are drying the chosen foot, the host, covered by a cloak and kneeling, recites: 'In the name of Christ, we welcome you to the hospital of San Nicholás, may the rest comfort you and give you the strength to continue your way to Santiago '. A kiss on the foot seals the ceremony. It then moves to the dinner, during which there are no electric lights but rather candles. After a brief blessing, which is usually focused on desiring the pilgrim a happy walk, the hosts serve the food, often pasta, seasoned with Parmesan, and accompanied with wine, in keeping with the oldest tradition of the Camino de Santiago hospital". A few meters from the chapel is Fitero Bridge, mentioned in the Codex Calixtino. At the other side of the river, a riverside and tree covered path on the banks of Pisuerga leads to Ítero de la Vega. 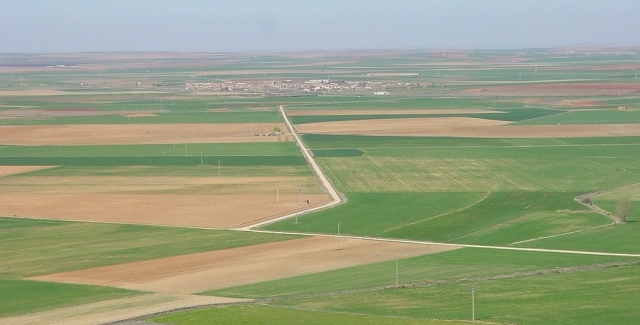 From Ítero de la Vega to Boadilla del Camino, the route involves five kilometres along farm tracks. Only the final section is protected from the sun by the shade of trees. In this stretch there is not a single bar or fountain. It is worth leaving prepared from Ítero de la Vega. Shortly after abandoning Boadilla del Camino, pilgrims should turn left at the crossroads and join a long straight path that will lead to the canal of Castilla, which for more than four kilometres will accompany them on a sensational journey to Frómista. The waters of the canal pass calmly, an indication that the surrounding terrain is quite flat. The canal of Castilla, a construction commissioned in the mid-eighteenth century by the Marquis of Ensenada a famous Spanish illustrator, the primarily aim of the canal was to provide transport to the sea for the ​​excess of cereal produced in the area. The huge canal, in total covers 207 km of hydraulic engineering. On its calm waters barges navigated from sunrise to sunset, initially driven by a mixed system of drag and wind sails, and later with the passing of years by horses. The pilgrim should cross its waters by a bridge over a quadruple lock, now at the doors of Frómista. The views are outstanding. Caution is required on the arrival to Castrojeriz. Cars, agricultural vehicles, pilgrims and cyclists share a narrow, two-way road. The only real complication of this stage is the summit of Mostelares, a demanding climb. It is certainly worth having well-calibrated brakes for the descent. It is a very steep slope. 1 reviews Distance to Santiago: 459 km. 1 reviews Distance to Santiago: 433 km. 1 reviews Distance to Santiago: 450 km. 1 reviews Distance to Santiago: 441 km. 1 reviews Distance to Santiago: 426 km.